I’ve been waiting a long time for some company, any company, to bring a big zoom to a smartphone. Two years ago, Oppo showed off a prototype handset with a 5X zoom at MWC. But alas, after all this time, Huawei has finally brought 5X optical zoom to the real world on the new P30 Pro. A zoom that big is the smartphone equivalent of walking around with a 17-88mm lens in your pocket, and on the P30 Pro, that’s enough to let me capture details on the spires of nearby buildings or snap pictures of passing pedestrians from 15 stories above. And normally, that alone would be enough to make a new phone interesting, but Huawei didn’t stop there. That’s because the P30 Pro (along with the standard P30) sports a completely redesigned camera that Huawei claims allows the P30 to shoot unprecedented low-light imagery. If you look close, you can how the 5x zoom lens on the far left sort of looks sunken compared to the other lenses. That’s because the 5x zoom camera uses a prism to bend light down into the phone where the P30 Pro’s periscoping lens lives. Across the industry, at the heart of most smartphones rests a sensor with a Bayer filter, which uses an array of red, green, and blue pixels so that the camera sensor can tell which colors are which. 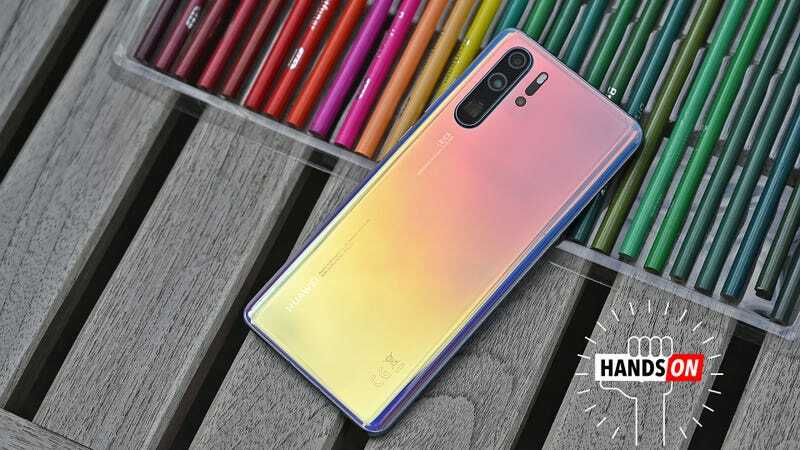 However, on the P30, Huawei says it has ditched traditional green pixels in favor of yellow pixels, with the idea being that yellow is an inherently lighter color than green, which lets more light overall reach the sensor below the pixels. The more light that hits the sensor, the brighter your pics will look, and with purported max ISO of 409,600, the P30 and P30 Pro’s low-light capabilities frankly sound kind of ridiculous. And while it’s not a true apple-to-apples comparison due to the vast difference in overall sensor size, compared to a modern mirrorless camera like a Nikon Z7, the Z7's max ISO even after you factor in its extended range, tops out at ISO 102,400, or four times lower than the P30. At this point, you might be wondering why, if switching to yellow pixels instead of green ones on a Bayer filter increases low-light performance so much, haven’t other companies done it? Well, the main reason is that all of the processing and image calculation that goes on inside modern digital cameras is based around the way those three primary colors interact. And for the P30, Huawei claims it had to completely re-engineer the phone’s entire camera stack (from its sensor to its image processor, to how it conveys all that information on a display still based on RGB pixels) just to make that one little change. It’s really quite a gamble. Note how the standard P30 on bottom has a headphone jack, while the P30 Pro (top), does not. From the front, aside from the size of their screens, the standard P30 (pictured here) looks almost identical to the P30 Pro. The main difference in design is that the P30 Pro (here) features a tapered screen with rounded edges similar to what you get on a Galaxy S10. But the camera wizardry doesn’t stop there; in addition to that 40-MP main camera and 8-MP 5x zoom—which uses a nifty periscoping lens and a prism to bounce light down inside the phone—the P30 also has 16mm ultra-wide angle lens for shooting landscapes. And as a special bonus on the P30 Pro, Huawei even tacked on a tricky 3D time-of-flight camera that should more accurately measure distance, something the phone uses to improve its portrait shots, or simply to calculate the size nearby objects using the phone’s dedicated measuring app. If that still isn’t enough, that P30 Pro’s 5x zoom (the standard P30 tops out at 3x), can be combined with digital zoom to create a 10x hybrid zoom, or pushed all the way to its limits to hit a full 50x magnification. Now at the range, things start to because seriously pixelized, but the fact that I could also use it to almost make out what was being displayed on the computer screen sitting on a desk in an office across the street was rather impressive, and maybe a bit creepy too. This really is Huawei throwing almost every imaginable new camera tech into the P30 Pro just to see what sticks. Here’s how the P30 Pro’s camera looks at 1x zoom. And here’s how it looks at 5x zoom, while shooting a building half a block away. And then 10x hybrid zoom (5z optical + 5x digital zoom). And here’s a full 50x zoom. It’s pixelated for sure, but you can still the various program windows on a monitor in a building across the street. Elsewhere, since the P30 is Huawei’s latest flagship phone, it naturally comes with the same sort of luxury features found on today’s premium handsets. You get a gorgeous glass-backed design with a 6.47-inch 2,340 by 1,080 curved OLED screen (or 6.1-inches on the standard P30), a Kirin 980 processor with dual NPUs, a huge 4,200 (or 3,650 mAh) battery, and sophisticated bonuses like an in-screen fingerprint reader and reverse wireless charging. Oh, and I can’t but help to mention the P30's upcoming colors which includes a new range of wild gradients with names such as Amber Sunrise, Breathing Crystal, Aurora, and Pearl White. Those colors are damn near enchanting, and when you compared them to the rest of the market, Huawei’s color schemes are easily the most alluring hues you can get on a phone. That said, if you’re a bit more reserved, you can still get a P30 or P30 in black. The only major feature the P30 has that the Pro doesn’t get is a headphone jack. The P30 Pro also comes with an IR blaster, which is something even Samsung ditched a few generations back. Look, I’m not really here to tell you how you should feel about Huawei as a company as it pertains to national security. But after checking out the new P30 and P30 Pro, I can’t help but be impressed with all the tech that Huawei has crammed inside its phone. And while we’re still waiting on official pricing, it’s safe to say that the P30 won’t be cheap. Regardless, I’m still looking forward to testing the hell out of this thing when it becomes available later this spring.